When I was in college, I bought a wonderful little cookbook called Pumpkin, Butternut, and Squash: 30 Sweet and Savory Recipesoff the sale rack at the local grocery store. The minute I picked it up, it had my heart. A cookbook entirely devoted to my favorite cucurbits? Heaven! Thankfully, I no longer live in a dorm, I now rent a room in a home with a gorgeous kitchen, and my cookbook collection has grown considerably. Pumpkin, Butternut, and Squash remains one of my favorites sources of inspiration come this time of year, and I wanted to share a recipe born of its pages with you today. This tidy little cookbook, written by Danish-Australian food writer Elsa Petersen-Schepelern, is wonderfully focused - every recipe features various pumpkins, winter squashes, and summer squashes. Her passion for food is evident, shown through her wide array of recipes, such as Pumpkin Seed Granola, Pumpkin Chips, Pumpkin Scottish Griddle Cakes, Vietnamese Chicken Curry with Coconut Milk, Pumpkin Risotto, Butternut and Zucchini Pulao, Indian Pakora Fritters, and a lovely Pumpkin Pie with Maple Syrup. I remember perusing the shelves of the co-op shortly after buying the cookbook, finding pumpkinseed oil I needed for the Asparagus and Zucchini Salad, and trying to budget out that $20 bottle of oil on my $7/hour summer job I was working at the time. That little bottle of oil brightened my outlook on life: I worked as a telemarketer selling long-distance phone service. It was both the worst and most entertaining job I've ever had. I only made it a month and a half before I couldn't take it anymore and quit on the spot one day. The glory of pumpkin seed oil provided escapism, and it was totally worth the cost. Let's come back to the present day. My pantry contents and cravings corresponded the other night, and I found myself making one of my favorite pumpkin recipes, a lovely Pumpkin Coconut Soup from this cookbook. I've made a few tweaks to the original recipe over time, but the spirit remains the same. I think you'll really like this soup. It has a velvety mouth feel, an alluring flavor, and a beautiful color that stimulates the senses. It is a easy to make and easy on the wallet, and packs in a ton of amazing vitamins, minerals, fiber, and antioxidants without a lot of carbs. This soup passed the test with my new housemates, and I had the chance to inaugurate two handmade pieces with my serving: a bowl I made in my ceramics class and an applewood spoon carved by a friend. Eating with handmade tools makes a dinner pure bliss! A bowl made by me and a spoon carved by a friend are delicious tools for eating soup. This vegan soup is rich, flavorful, and filling. The original recipe calls for 2 large potatoes in addition to the pumpkin. Instead of using potato, I like to substitute a mixture of cauliflower. You can also substitute the potatoes with sweet potatoes. Choose potato or a substitute, whichever option fits your diet, tastes, and pantry best. Also, can use squash in place of pumpkin if you prefer; I'd recommend using a dense-fleshed squash like kabocha/Hokkaido, red kuri, buttercup, or hubbard. Check out my variations below for other ways of preparing the pumpkin (or squash) for this soup - each way lends a slightly different flavor. Slice pumpkin in half and remove seeds. Peel pumpkin and cut into 3/4" chunks, and prepare other vegetables as directed above. Heat oil in a large stockpot or kettle, then add onions, garlic, and ginger. Saute on low heat for 5 minutes, stirring occasionally, until onions are softened and translucent. Add parsnip, cauliflower, and pumpkin, and stir to coat. Saute for 5 more minutes, stirring often. Add 6 cups broth/water, and bring to a boil. Reduce heat and simmer for 10-15 minutes. Then add coconut milk and continue to cook until all vegetables are softened through. When vegetables are soft, remove from heat. Blend until smooth using an immersion blender, or transfer to a blender and blend in batches as necessary (be careful blending hot liquids). Return soup to low heat, adding additional 1 cup water/broth if necessary to reach desired consistency. Season to taste with cayenne pepper and salt/umeboshi plum vinegar. Serve hot, garnished with cayenne pepper, freshly chopped cilantro, and perhaps a swirl of coconut milk or your favorite creamy yogurt-like stuff. Store in the refrigerator for 4-5 days, or freeze for longer storage - this soup freezes really well. Baking the pumpkin first concentrates the sugars and gives it a sweeter flavor. To do this, heat oven to 400º F. Place unpeeled pumpkin halves cut side down on a baking sheet, and bake for 40-50 minutes, until pumpkin is soft and flesh is scoopable. Prepare the soup as directed, adding cooked pumpkin to pot with other veggies in place of the pumpkin cubes, and continue to prepare as directed. For an even roastier, sweeter flavor (my favorite!!! 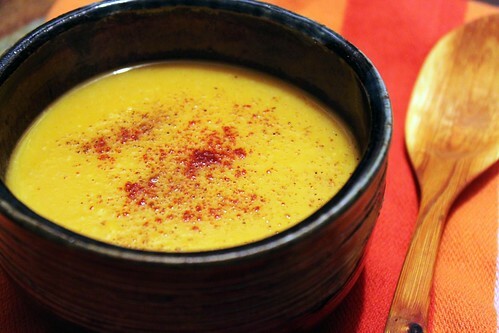 ), you can make it with roasted pumpkin. Peel and cube the pumpkin in 3/4-inch pieces, then place on a baking sheet. Coat with 2 Tbsp of coconut oil, and roast in a pre-heated oven at 400º for 15 minutes. Remove from oven, toss, and roast an additional 15 minutes, until pumpkin is soft and golden brown, but not burnt. Remove from oven. Prepare the soup as directed, adding roasted pumpkin cubes to pot with other veggies in place of the raw pumpkin cubes, and continue to prepare as directed.